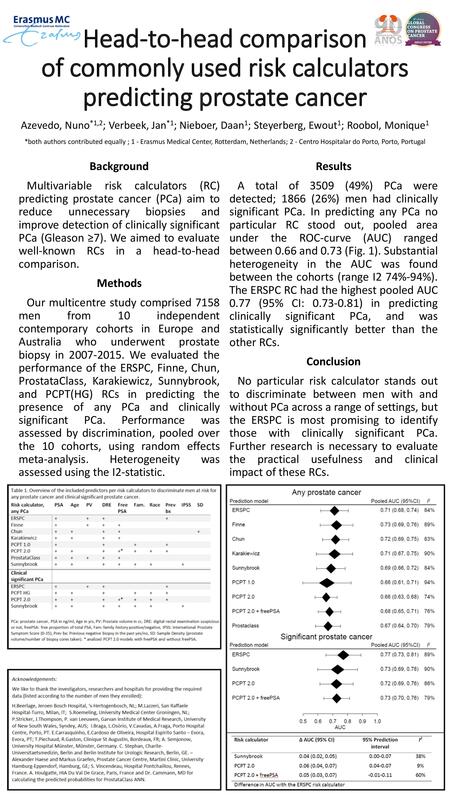 Background: Multivariable risk calculators (RC) predicting prostate cancer (PCa) aim to reduce unnecessary biopsies and improve detection of clinically significant PCa (Gleason ≥7). We aimed to evaluate well-known RCs in a head-to-head comparison. Methods: Our multicentre study comprised 7158 men from 10 independent contemporary cohorts in Europe and Australia who underwent prostate biopsy in 2007-2015. We evaluated the performance of the ERSPC, Finne, Chun, ProstataClass, Karakiewicz, Sunnybrook, and PCPT(HG) RCs in predicting the presence of any PCa and clinically significant PCa. Performance was assessed by discrimination, pooled over the 10 cohorts, using random effects meta-analysis. Heterogeneity was assessed using the I2-statistic. Results: A total of 3509 (49%) PCa were detected; 1866 (26%) men had clinically significant PCa. In predicting any PCa no particular RC stood out, pooled area under the ROC-curve (AUC) ranged between 0.66 and 0.73 (Fig. 1). Substantial heterogeneity in the AUC was found between the cohorts (range I2 74%-94%). The ERSPC RC had the highest pooled AUC 0.77 (95% CI: 0.73-0.81) in predicting clinically significant PCa, and was statistically significantly better than the other RCs. 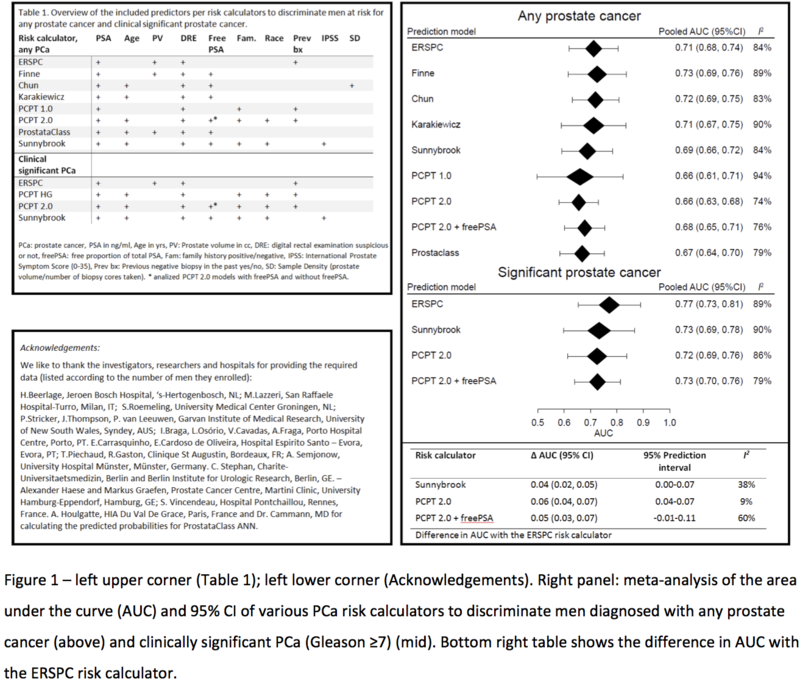 Conclusion: No particular risk calculator stands out to discriminate between men with and without PCa across a range of settings, but the ERSPC is most promising to identify those with clinically significant PCa. Further research is necessary to evaluate the practical usefulness and clinical impact of these RCs.